Khalidi was born in 1897, nearly a half-century after Lebanese author Ahmed Faris al-Shidyaq published his genre- (and gender)-bending four-volume Leg Over Leg. Yet Khalidi’s feminism seems in many ways less ambitious than al-Shidyaq’s. Khalidi’s was instead inspired by Qasim Amin (1863-1908), a writer sometimes called the “first Arab feminist.” While that’s doubtful — al-Shidyaq’s feminism is surely more fun than Amin’s — Amin was perhaps the first prominent Arab writer to argue in favor of following the patterns of Western gender relations. Khalidi describes herself as “an avid reader, there being no other means of entertainment.” She notes that there were no particular books for children in those days, but she was engaged both by the story of ‘Antar and the Thousand and One Nights. Khalidi describes Ziadeh, who she met, as combining “scholarly maturity with the coquetry of a lovely young woman” and “profound thinking” with “an overpowering feminine mystique.” In this depiction, Ziadeh doesn’t sound altogether different from women writers of an earlier era — or at least such were the expectations hung on her, the lens through which she was often seen. Khalidi glosses over the end of Ziadeh’s life, when she fell into a depression around 1935 and her relatives had her legally declared incompetent and committed her to a hospital for mental diseases. Her friends eventually obtained her release, but this imprisonment left its mark on the rest of her days. 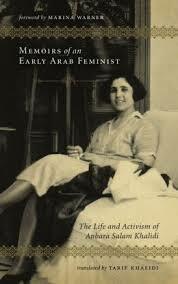 Khalidi’s memoirs are probably not for the casual reader, but for the reader interested in Lebanese history of the early 19th century, particularly the histories of upper-class women, they will certainly be of interest. Very interesting but rather a bit short .